1. The Die-Hard Sports Fan's Guide to Boston. This 270-page book is a must-have for that Boston sports fan in your life. Part history, part guidebook, The Die-Hard Sports Fan's Guide to Boston is packed with "I didn't know that" facts about Boston sports (did you know Benjamin Franklin swam in the Charles as a young boy growing up in Boston and is now in the International Swimming Hall of Fame?) 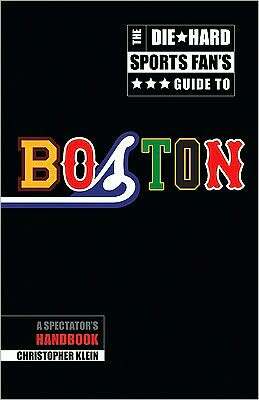 and practical information that fans need to have a great time at spectator sporting events in and around Boston. The book covers 25 different sports (from baseball and football to Aussie Rules football and polo) and includes information on the city's professional, college, high school, and amateur sports scene. Get all the information on getting tickets, best places to sit, stadium concessions, where to eat and drink before the game, best places to score autographs, even how to save some money or go crazy and splurge. Plus, there are profiles of Boston's best sports bars, a listing of Boston-friendly sports bars around the world (from Manhattan to Kyoto), a sports-themed walking tour of downtown Boston, and even ideas for Boston sports road trips. Available from Amazon.com, bn.com, and local bookstores like Back Pages Books in Waltham. 2. Boston sports T-shirts. There are some really creative T-shirts being made by some local companies. I just picked up this cool "Blizzard of 59" T-shirt from Sully's. Sully's has lots of other great T's supporting the local pro teams or taking a knock at arch enemies (really like the shirt that says "I Hate Peyton Manning" on the front and takes a shot at Eli on the back). If you want to celebrate obscure Boston sports franchises, head over to Ebbets Field Flannels. They have T-shirts with logos for the Boston Beaneaters (Player's League baseball team from 1890), the Boston Shamrocks (a football team from the 1930s that played at Fenway), and the Boston Wonder Workers (a soccer team from the 1920s that played at the old South End Grounds). Really unique stuff. Click here for the Boston shirts. 3. Tickets. If you'd rather not buy any more "stuff," get some tickets for your sports fan. If money is no object, pick up some tickets to the Winter Classic at Fenway Park from a local ticket agency. The Bruins will skate there against the Flyers on New Years Day. If the price is too steep, Bruins legends will take to the ice the following day to raise money for charity. Red Sox tickets will be even more expensive this year. The first tickets go on sale December 12. For cheap ticket options, check out season tickets for the Boston Blazers lacrosse (starting at $80), the Boston Breakers women's soccer team (starting at $165), and Boston University basketball ($78). Very sad to read the news on the front page of this morning's Boston Globe that Northeastern University has decided to fold up its football program after 74 seasons. There's no arguing with the point made by Dan Shaughnessy in today's sports section that Boston is first and foremost a professional sports town with much of the fan and media interest focused on the Sox, Pats, Bruins, and Celtics. Still, what makes Boston such a bountiful place for the die-hard sports fan is the plethora of college, high school, and amateur sporting events that are infused with an organic crowd energy and lack the overwrought "game presentation" (see T-shirt tosses, noise meters, thunderstix, etc.) that can make the action on the field a secondary consideration at some professional games. Leaving aside the matter of whether the move was justified or not by the university, losing another one of these options means a less vibrant sports scene for Boston fans. Northeastern football didn't have the history of Harvard, Boston College, or even Boston University (which canned football in 1997), and its off-campus location at Parsons Field made it difficult to draw the student body. But Northeastern football offered one of the few accessible, affordable, and family-friendly options for pigskin fans. Parsons Field is just a short walk from the Green Line, and parents could wheel their strollers right through the gates and right up to the bleachers--something that's not an option at the other Division 1 college venues. As Shaughnessy writes about today, Parsons Field was "never a destination for big-time football buffs" and its most historic moment may have been when Babe Ruth played there with neighborhood kids. To me, though, Parsons Field had some quirks that made it a unique college football venue. You could stand right along the fence behind the east end zone and watch the goaline action from a unique vantage point. I enjoyed watching the field goals and extra points sailing through the uprights and landing on the roof of the long, squat field house (or perhaps clear it completely) behind the end zone. Kids would have fun waiting for the ball to roll down off the roof of the house, probably like many backyard Nerf football games across New England. There was also a statue of the university's mascot, King Husky, keeping perpetual guard to the field house. It's a shame, too, that the news wasn't announced until the season was over so that the football program could have received a proper send-off at Parsons Field from the fans. If you want to take a (now nostalgic) look at Northeastern football, there's a section in the football chapter of The Die-Hard Sports Fan's Guide to Boston. A cranky George Washington hit the road from his Watertown accommodations, which he was not too fond of, early on the morning of Friday, November 6, 1789. This day would be his last full day traveling through Massachusetts on his way back to the capital of New York City. The weather was threatening. The president wrote in his diary that he left Watertown "under great appearances of Rain or Snow." The president's disposition wasn't much better this day. He was a little steamed at having to stay in Watertown, rather than in Waltham, in the first place, let alone in his subpar accommodations. In his diary for November 6, the president dispels any notions that the difficulty of navigating roads around Boston is a modern phenomenon and then he goes off on the inability of Bay Staters to give proper directions: "The Roads in every part of this State are amazingly crooked, to suit the convenience of every Mans fields; & the directions you receive from the People equally blind & ignorant; for instead of going to Watertown from Lexington, if we had proceeded to Waltham we should in 13 Miles have saved at least Six; the distance from Lexington to Waltham being only 5 Miles and the Road from Watertown to Sherburn going within less than two miles of the latter (i.e. Waltham)." Back on the crooked roads, the presidential party passed through Needham before stopping in Sherborn for breakfast after covering 14 miles. Luckily, the skies brightened (although we can't be sure the same could be said of the president). Washington then crossed through Holliston, Milford, and Mendon before settling in for the night in Uxbridge. In a case of Washington (Almost) Slept Here, the presidential party was turned away at the first place it tried to stop for the night. Washington wrote in his diary: "The House in Uxbridge had a good external appearance (for a Tavern) but the owner of it being from home, and the wife sick, we could not gain admittance." A National Park Service brochure identifies that tavern as the Ammidon Tavern, which still stands on Main Street in Mendon. Being turned away at the Ammidon, Washington stayed instead at the Samuel Taft House in North Uxbridge. (President William Howard Taft would later visit his ancestral home as well in 1909.) The president's review of the Taft house wasn't overwhelming in his diary: "though the people were obliging, the entertainment was not very inviting." 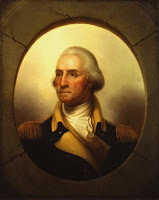 However, Washington must have been very smitten by the Tafts, since two days after his stay he penned the following to the family and included some gifts: "Being informed that you have given my name to one of your Sons, and called another after Mrs. Washington's family. And being moreover very much pleased with the modest and innocent looks of your two daughters Patty and Polly I do, for these reasons, send each of these Girls a piece of chintz. And to Patty, who bears the name of Mrs. Washington, and who waited more upon us than Polly did, I send five guineas, with which she may buy herself any little ornaments she may want, or she may dispose of them in any other manner more agreeable to herself. As I do not give these things with a view to have it talked of, or even to its being known, the less there is said about the matter the better you will please me; but that I may be sure the chintz and money have got safe to hand, let Patty, who I dare say is equal to it, write me a line informing me thereof directed to 'The President of the United States at New York." Washington left the Tafts early on the morning of November 7, before sunrise. After passing through the Douglas woods, the president had left Massachusetts, nearly three weeks after he first passed through Agawam. I hope you've enjoyed reading about the first presidential visit to the Bay State. Many more presidents would follow George Washington's lead in the centuries to come finding Massachusetts a welcoming place to visit. Alas, the roads may not have gotten that much better since George's time. George Washington woke up the morning of November 5, 1789, in Haverhill, Massachusetts. In his diary, the president called the town and the area along the Merrimack River "a beautiful part of the Country." Around sunrise, Washington took a ferry across the Merrimack and traveled through Bradford before arriving in Andover (my hometown, hooray!). He had breakfast at the Abbot Tavern, which still stands at 70 Elm Street. Supposedly, the innkeeper's daughter Priscilla received a kiss on the cheek from the president for repairing his riding glove. (The tavern was later Andover's first post office.) While in Andover, Washington visited the house of Samuel Phillips, who was then Massachusetts Senate President. He was also the father of Samuel Phillips, Jr., the founder of Phillips Andover Academy, which was established in 1778. (One of the large buildings on campus is named in Washington's honor.) According to some accounts, Washington addressed Phillips students on horseback before leaving town. Phillips accompanied Washington through Billerica and the president was very impressed with the scenery on his entire route through the Merrimack Valley, writing: "The Country from Haverhill to Andover is good, and well cultivated. In and about the latter (which stands high) it is beautiful. A Mile or two from it you descend into a pine level pretty Sandy, and mixed with Swamps; through which you ride several Miles till you begin to ascend the heights on which the Town of Bellarika stands, which is also pleasantly situated 10 Miles from Andover." Washington stopped in Lexington to dine at the Munroe Tavern and to pay his respects at the Battle Green, or what he referred to in his diary as "the Spot on which the first blood was spilt in the dispute with great Britain on the 19th. of April 1775." (Again, as on October 26, Washington uses the word "dispute.") The Munroe Tavern, operated by the Lexington Historical Society, is open to the public, and the room where Washington dined has been preserved. The society is in possession of the chair that Washington sat in along with a 20th century painting depicting his visit. The president continued on from Lexington to Watertown, where he spent the night at the tavern kept by the widow of Nathaniel Coolidge near the bridge from Watertown Square. The site of the tavern along Galen Street is now home to the MBTA's Watertown Yard, where numerous bus lines terminate. A plaque near the bus stop commemorates the tavern. Washington noted in his diary that the Coolidge Tavern was a "very indifferent one." Ouch. That couldn't have been good for business. Good thing for the widow Coolidge that GWashington couldn't post that review on TripAdvisor. TOMORROW: The last full day in Massachusetts. George Washington hit the road again on November 4, 1789, to continue his presidential tour of New England. According to some accounts, Washington intended to proceed from Portsmouth, New Hampshire, to Vermont only to be dissuaded by reports of poor weather (gee, in November?) So instead, Washington headed to Exeter, New Hampshire, before starting his southern journey back to the capital city of New York. Whatever the reason for Washington's change of plans, it was a blessing to the citizens of Haverhill, Massachusetts, who would end up having the president of the United State spending a night in their town. Washington left Portsmouth at 7:30 a.m., and it was a much different scene from his grand entrance into town. The president wrote in his diary that he left "quietly & without any attendance, having earnestly entreated that all parade & ceremony might be avoided on my return." Following Exeter, Washington passed through Kingston and arrived in Haverhill by 2:30. With much of the afternoon ahead of him, the president took a stroll through the streets of Haverhill before turning in at Harrod's Tavern. A Pentucket Bank now stands on the site of the tavern, and there is a sign at the bank describing its historical connection. The Buttonwoods Museum, run by the Haverhill Historical Society, has a mirror in its front parlor that Washington supposedly used to adjust his wig and petticoat. Check out this web site for details on Washington's stay in Haverhill. While George Washington remained in Portsmouth, New Hampshire on Tuesday, November 3, 1789, his first engagement of the day had a tie back to his stay the prior week in Boston. 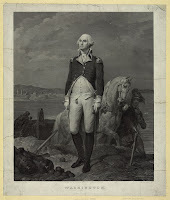 Washington spent the morning sitting for a portrait that was requested by Boston merchant Samuel Breck. The president wrote in his diary that the portrait "was an earnest desire of many of the Inhabitants of that Town that he might be indulged." After sitting for two hours, the president probably enjoyed a stretch of his lanky frame, and he paid a visit to the president (another term for governor) of New Hampshire, John Sullivan, supposedly at the Pitt Tavern, which today is part of the Strawbery Banke Museum. Then he popped over to the Tobias Lear House to pay his respects to the mother of his private secretary, Tobias Lear. That house also stands and is open to the public. According to the house's web site, Washington visited Madame Lear in the front parlor as a crowd watched on from the street. 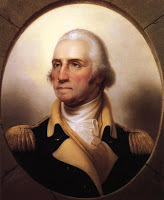 Washington returned to his quarters and received several visits before dining with state officials. That evening Washington was the guest of honor at a party. 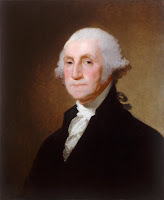 Washington writes in his diary: "At half after Seven I went to the Assembly where there were about 75 well dressed, and many of them very handsome Ladies--among whom (as was also the case at the Salem & Boston Assemblies) were a greater proportion with much blacker hair than are usually seen in the Southern States." I'll give it a rest today and let George Washington speak for himself as to his activities around Portsmouth, New Hampshire on November 2, 1789, during his presidential tour of New England. This is his from his diary: "Monday 2d. Having made previous preparations for it--About 8 Oclock attended by the President, Mr. Langden & some other Gentlemen, I went in a boat to view the harbour of Portsmouth; which is well secured against all Winds; and from its narrow entrance from the Sea, and passage up to the Town, may be perfectly guarded against any approach by water. The anchorage is also good & the Shipping may lay close to the Docks &ca. when at the Town. In my way to the Mouth of the Harbour, I stopped at a place called Kittery in the Provence of Main, the River Piscataqua being the boundary between New Hampshire and it. From hence I went by the Old Fort (formerly built while under the English government) on an Island which is at the Entrance of the Harbour and where the Light House stands. As we passed this Fort we were saluted by 13 Guns. Having Lines we proceeded to the Fishing banks a little with out the Harbour and fished for Cod--but it not being a proper time of tide we only caught two--with wch. about 1 Oclock we returned to Town. Dined at Col. Langdons, and drank Tea there with a large Circle of Ladies and retired a little after Seven O'clock. Before dinner I recd. an address from the Town--presented by the Vice-President and returned an answer in the Evening to one I had recd. from Marblehead and an other from the Presbiterian Clergy of the State of Massachusetts & New Hampshire delivered at Newbury Port; both of which I had been unable to answer before." The Sabbath was always a quiet day on the presidential itinerary, and November 1, 1789, was no different for George Washington. In the morning, Washington attended services at St. John's Episcopal Church, and the afternoon he attended services at the North Congregational Church, which still towers over Market Square. The original St. John's church building was destroyed in an 1806 fire, but the chair where Washington sat for the service was rescued and is still in the church's possession. After the church services, Washington spent the afternoon writing letters and dining in his lodgings. After breakfast, Washington crossed the Merrimack River by ferry at Salisbury and soon came to the border with New Hampshire. Here, the president exchanged traveling parties. Dalton, General Jonathan Titcomb's corps, and other militia brought Washington to the border and a delegation that included New Hamsphire's two U.S. Senators, militia, and the vice president of the state took him from there. The presidential party made their way up through the seacoast towns of New Hampshire. There was no Hampton Beach Casino or New Hampshire Liquor Store on the main highway back then in the Live Free or Die State, but Washington did stop at some of the towns on his way to Portsmouth. One historical marker in Hampton Falls commemorates Washington's visit. Washington's lodgings in Portsmouth was the tavern kept by Colonel William Brewster at the corner of Court and Pleasant Streets. The tavern was lost in an 1813 fire, but a white Bolton type coverlet from Brewster's tavern under which Washington is said to have slept is kept at the John Paul Jones House, which is open to the public seasonally. The Portsmouth Historical Society, which operates the house, also has in its possession a shoe worn by Sally Brewster when she attended the ball given in Washington's honor. Sally rode in the carriage with the president on the way to the ball. Lest you think the single shoe is a Cinderella-type saga, supposedly Sally gave one shoe to one daughter and the other to a second daughter. If anyone knows where the other shoe lurks, let the Portsmouth Historical Society know. Washington dined that evening with the state's president, vice president, senators, and other dignitaries before having tea at the home of Senator John Langdon on Pleasant Street. The John Langdon House still stands and is open seasonally to the public by Historic New England.